The Sanctuary Movement has grown from 400 to 1,100 congregations nationwide since Donald Trump’s election. Sanctuary congregations aid immigrants and the immigrant community in a variety of ways, including hosting legal clinics, advocating against and taking actions to stop deportations and housing immigrants in danger of deportation. In the months after Donald Trump’s election, the number of congregations offering sanctuary to immigrants under threat of deportation doubled from 400 to 800 nationwide. 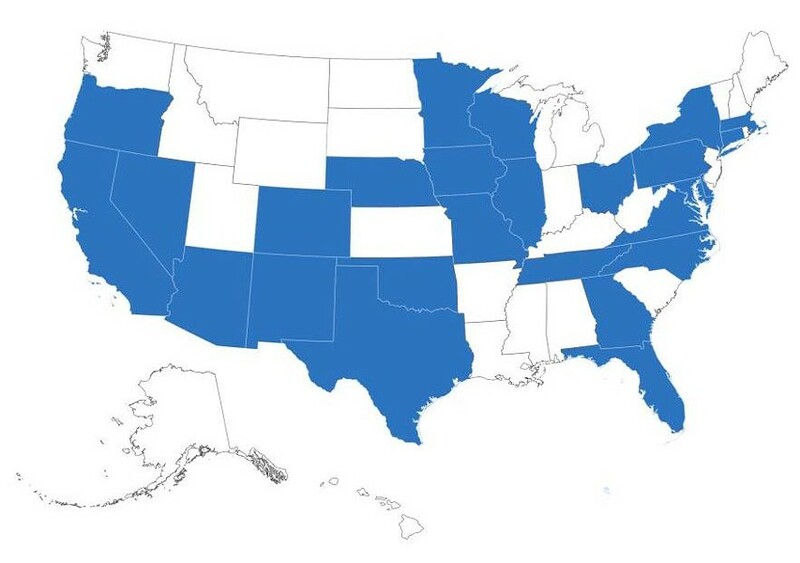 The movement continues to grow, across 25 states. And the number of Sanctuary coalitions have grown from 12 to 40 since 2016, according to a new report, “Sanctuary in the Age of Trump,” released by a coalition of faith leaders, including Rev. 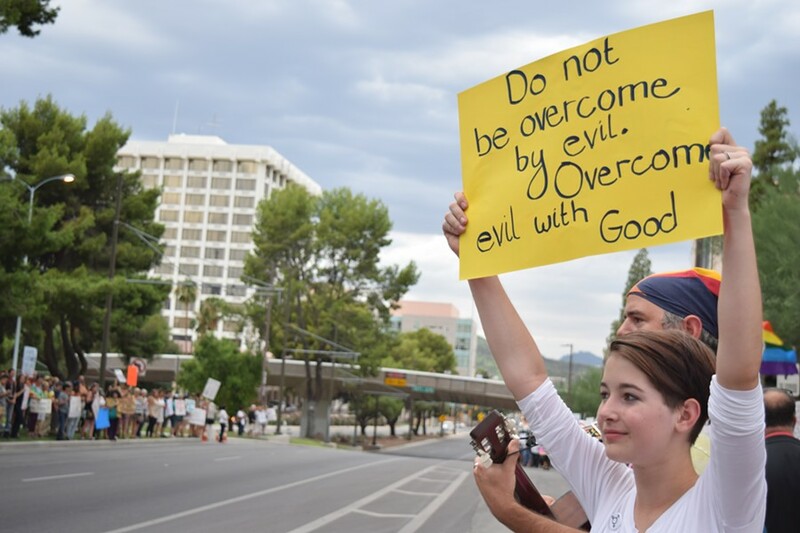 Alison Harrington, a pastor in Tucson’s Southside Presbyterian Church. The authors of "Sanctuary in the Age of Trump"
The blue states have active Sanctuary coalitions. 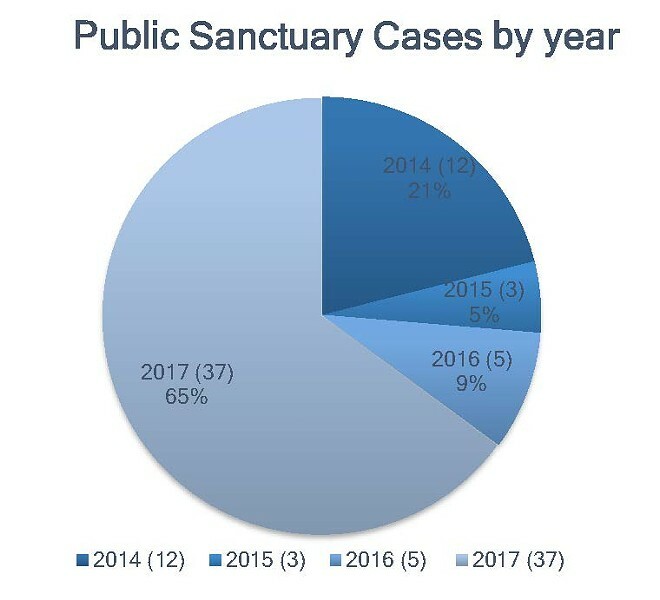 North Carolina currently has more people in sanctuary than any other state, with five. And their movement continues to grow, with six more congregations working on becoming sanctuary churches and more calling each day, said Rev. Julie Peeples, senior pastor at Congregational United Church of Christ, in Greensboro, North Carolina. 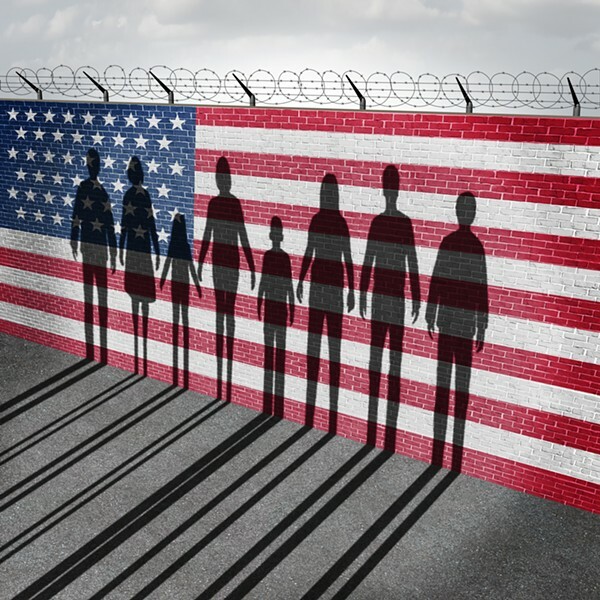 The report also says that it’s no longer just cities with large immigrant population that have congregations in the Sanctuary Movement, but more rural areas with a recent influx of immigrants, in states like North Carolina, Ohio, Oklahoma and Virginia. Congregations gave sanctuary to 37 people facing deportation, in 2017. Nine received some sort of temporary reprieve from deportation. Today, there are 36 people in public sanctuary, nationwide, according to the report. Thirty-seven people that went into Sanctuary in 2017. Nine of them retrieved some sort of reprieve from deportation. The Sanctuary Movement has grown in direct response to the ramping up of deporting immigrants whose only crime is being in the country illegally, many of whom were registered with Homeland Security and allowed a stay of deportation under the Obama administration, given they participated in routine check-ins with ICE. In 2011, Immigration and Customs Enforcement Director John Morton released a series of immigration directives that came to be known as the Morton memos. These memos limited the immigration enforcement to a subset of convicted criminals, as well as blocking immigration enforcement to crime victims, witnesses and “individuals pursuing legitimate civil rights complaints,” a measure that allowed immigrants to report crime without fear of deportation. Today, ICE searches these people out, although they are well known to the government and have complied with their regular check-ins. The new report details the arrests of several immigrants with deportation stays who are immigrant rights activists, including immigrate-rights activist Ravi Ragbir, who was detained during a routine check-in meeting with ICE officials in Manhattan, on Jan. 11. Ragbir was one of a number of immigrants vocal in the movement arrested by ICE in January. His arrest sparked protest that ended with 18 arrests, including two members of the New York City Council. On Monday, Jan. 29, U.S. District Judge Katherine Forrest ordered his release, saying his detention was “unnecessarily cruel.” He is still facing deportation. The faith leaders who contributed to the report said they plan on expanding the movement in the Southwest and Midwest and hosting trainings and strategy meetings. “Sanctuary in the Age of Trump” also details stories of several immigrants who and sought sanctuary, more examples of ICE ramping up intimidation tactics, and 10 policy recommendations.